Chinese paper cuttings, 剪纸（jiān zhǐ, also sometimes referred to as 窗花 chuāng huā, meaning window flowers), are commonly used to decorate doors and windows in China. Chinese people believe that hanging the carefully crafted pieces of paper, frequently red, on one’s door can bring good luck and happiness to the whole family. They are more often seen during traditional Chinese festivals, particularly during Chinese New Year. They are also frequently given as presents or gifts to friends or family. In traditional Chinese culture, these paper cuttings can symbolize many aspects of life, such as one’s happiness, longevity, or good harvest. In the spring festival, each family will paste the Chinese character 福 (fú) on the door, which means “blessings, happiness, and good fortune.” As you can see in the picture below, though, it is always pasted upside down. Why, might you ask? Because the character 到(dào), which means “coming,” and the character 倒(dào), which means “upside down,” have same pronunciation in Chinese. The upside down 福 is actually a pun that implies “福到（倒）了” – good fortune has arrived! 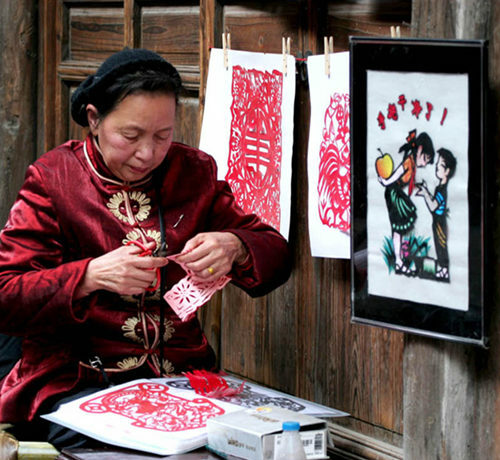 In China’s rural countryside, paper cutting is traditionally a female activity. In the past, all girls were expected to master it, and brides were often judged by their skill. Before marriage, women needed to cut lot of differently styled to decorate their houses, so that their relatives, friends and even neighbors would be able to judge whether or not the girl would make a good wife. Today, though, professional paper cutting artists are usually male, and have guaranteed incomes working together in workshops. As you might know, paper was invented in China by Cai Lun during the Eastern Han Dynasty (25-220). The oldest surviving paper cutout is a symmetrical circle from the 6th century found in Xinjiang. 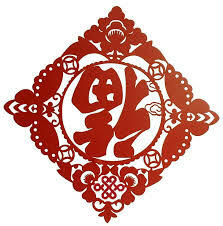 From the 7th to the 13th century, paper cutting became especially popular during Chinese holiday festivals. In the 14th century, The art form spread to the rest of the world. Throughout the rest of the Qing Dynasty, many paper-cutting skills were developed, including drafting and the use of smoked papers. As the Qing dynasty came to an end, however, new art forms were being introduced, so fewer and fewer people became interested in traditional Chinese crafts. The Republic of China has actively tried to revive the art since the 1980s, and as part of the country’s cultural heritage, many teenagers are encouraged to learn paper cuttings. In fact, today many International Colleges in China offer paper cutting as a Chinese cultural course! Isabella got a Bachelor degree of Teaching Chinese as Foreign Language in 2010. Then she arrived in Australia and got a part time job in local language center. During the same time, she got her Master degree at Queensland University of Technology. She found many ways to make her students interested in learning Chinese and students improved their Chinese very fast. She really enjoyed her teaching time.